Natalie Esposito Capano received a Bachelor of Arts in Spanish with a Minor in Speech Communications at the Pennsylvania State University and her Juris Doctorate from Seton Hall University School of Law, Newark, NJ. During law school, Natalie worked as a Research Assistant for the Honorable Peter W. Rodino and as a law clerk for Gill and Chamas, located in Woodbridge, NJ. 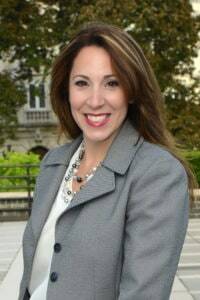 Mrs. Capano was admitted into the New Jersey Bar in 2002, and from 2002 to 2003, Natalie worked as a Judicial Law Clerk for the Honorable Brian R. Martinotti, J.S.C., of the Bergen County Superior Court. Following this, Mrs. Capano joined the firm of Rabbat & Rabbat, in Totowa, NJ and worked there for over 8 years. In 2011, Natalie opened her own firm and started the Law Offices of Natalie Esposito Capano, LLC, in Woodland Park, NJ. In 2014 Ms. Capano joined the firm of Aretsky Law Group, P.C., as Of Counsel in their Divorce & Family Law department. Natalie has been practicing law since her admission to the bar in 2003. She has significant experience in legal research, brief writing, motion practice, courtroom litigation, and appellate practice. Natalie is an experienced litigator with over 15 ears of experience in complex divorce litigation. In addition to being a skilled litigator, Ms. Capano has also assisted clients resolve their divorce and family law isuues through negotiation and mediation. She will mediate in Bergen, Passaic, Hudson, and Morris counties. Ms. Capano is dedicated to protecting the rights of New Jersey fathers who strive to maintain a positive relationship with their children. She understands that New Jersey law requires decisions regarding child custody and parenting time to be gender neutral and has vast experience fighting for fathers’ rights. A recent case involved a father who sought shared parenting time with his 1½-year-old-daughter. Ms. Capano immediately obtained parenting time and when his wife continued to refuse overnights, she filed a motion and achieved a favorable result of 10 overnights in a month. Because her client still disputed custody, Ms. Capano requested the Court to order a custody expert During the expert’s evaluations and in the midst of discussions regarding financial issues, the mother took a job overseas and began her move without obtaining the father's consent. Ms. Capano opposed this move, and the mother filed a relocation application. Due to her zealous advocacy, Ms. Capano was able to defeat the application and arrange a 44/56 split of parenting time between New Jersey and the Wife’s new residence in another country. This arrangement will continue until the child is in kindergarten, at which time the New Jersey courts will revisit the arrangement. Natalie Esposito Capano has been married to Vincent Capano for twelve years. The couple has resided in Allendale, New Jersey, with their two young children since 2009. Ms. Capano is very active in her community, especially in the field of education. Ms. Capano is fluent in Spanish and is a fluent speaker of Italian.